On Aug. 17 at 5:41:04 a.m. Mountain Standard Time, the Laser Interferometer Gravitational-Wave Observatory (LIGO) detected a burst of gravitational waves. About two seconds later, a brief flash of gamma rays was observed by the orbiting Fermi Gamma-ray Space Telescope and by the International Gamma-Ray Astrophysics Laboratory. Immediately, a team of astronomers, including Arizona State University's Nathaniel Butler, started using ground-based telescopes as well as space telescopes to try to pinpoint a candidate source in the sky. Based on the date when it occured, astronomers designated the gravitational wave source as GW170817. The nearly simultaneous timing between the gravitational waves and the gamma-ray burst helped the team zero in on an elliptical galaxy designated NGC 4993. It showed a bright spot in visible, infrared and ultraviolet light where previous images of the galaxy showed nothing unusual. This was the first time ever that light emitted from a source of gravitational waves has been observed. The team's report was published Oct. 16 in the journal Nature. Gravitational waves are ripples in space-time caused by events such as collisions or mergers between massive objects — for example, neutron stars or black holes. "Gravitational waves are signals from the most powerful events that occur in astrophysics," said Butler, who is an associate professor in ASU's School of Earth and Space Exploration. 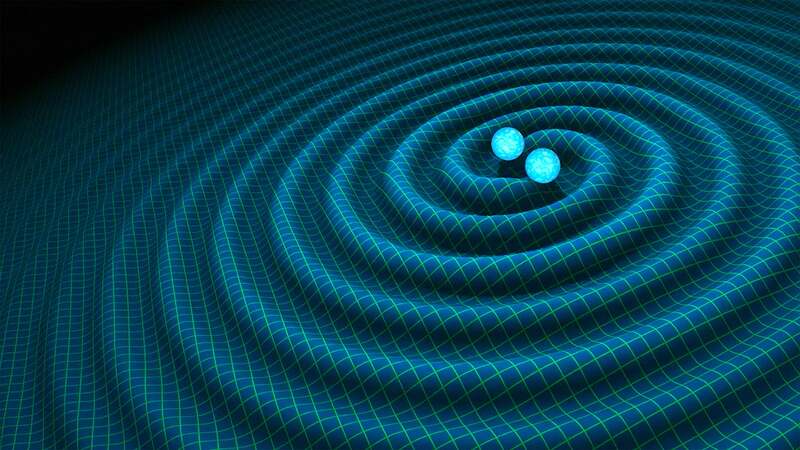 Gravitational waves travel at the speed of light. When they pass through a gravitational wave "telescope" or detector, they reveal themselves by tiny, transient changes in the instrument. Currently, three gravitational wave detectors are in operation. Two that are part of LIGO are in the United States, in Louisiana and Washington State, and one is in Italy near Pisa. Two additional detectors are being built in Japan and India. Gravitational wave detectors work by measuring with extreme precision the distance between a central laser light source and mirrors at the ends of two arms at right angles to each other. At LIGO, each arm is 4 kilometers (2.5 miles) long. When a gravitational wave passes through the instrument, the distances along the arms briefly stretch and shrink by fractions of a millimeter, distorting the laser beam from the central source. But local disturbances cause a lot of jitter in the instrument. To identify a passing gravitational wave, astronomers need to sift carefully the real signals from countless false ones. As a result, up until the Aug.17 event, only four such gravitational wave events have been reliably detected, one of them just three days before, on Aug. 14. Butler was part of the team that identified the source in a distant galaxy and calculated the power of the explosion. This helped astronomers determine what caused the blast of gravitational waves. "We were lucky," Butler said, "because the source emitted a gamma-ray burst that we could easily locate in the sky." The gamma-ray burst was identified as coming from a small area of sky in the constellation Hydra. As noted above, this let the astronomers examine the area closely with ground-based and other orbiting telescopes. Butler explained, "The host galaxy — NGC 4993 — is relatively bright and so was the visible light source. In fact, at magnitude 16, it could have been seen by eye in a large backyard telescope." The galaxy lies about 130 million light-years away. After the team identified the likely source for the gravitational waves, the next question involved what caused the outburst. That meant examining evidence across all wavelengths where the source was visible. These spanned radio waves, visible, infrared and ultraviolet light, plus X-rays and gamma rays. One possibility the team considered and then set aside: a supernova. These occur when a massive star reaches the end of its normal existence and blows up in a colossal explosion. However, a supernova would be too powerful to be the source that was seen in the galaxy. A better fit is smaller explosion that astronomers call a "kilonova." These occur when a pair of neutron stars are locked in a binary system where they orbit each other. Being objects with strong gravity, as they orbit they steadily emit gravitational waves. These are too small to be detected from Earth, but nonetheless steal orbital energy and velocity from the pair. As their orbital velocity bleeds away, the neutron stars move closer and closer. When they touch, they quickly merge — and a kilonova explosion erupts. The multiwavelength observations also helped fill in the picture of what surrounded the pair before and after the kilonova eruption. "There is some discussion among the team about the details," Butler said. "However, it appears that the system would have included the binary pair, a disk of gas around them, and jets of high-temperature gas and energetic particles shooting out at right angles from the disk. "Surrounding this at a greater distance would be shells of gas, charged to glow by the radiation coming from the binary pair." According to the team, the view from Earth suggests that we are not looking straight down one of the jets, nor are we observing the disk in its equator. Rather the view is from an intermediate angle. "This was an exciting discovery," Butler said, "because we finally detected light across the electromagnetic spectrum from an event associated with gravitational waves. It brought a lot of pieces together." It also confirmed, he said, "that some gamma-ray bursts are narrowly beamed toward us and arise from the merger of neutron stars. And now we know for the first time at least one kind of astrophysical system that emits detectable gravitational waves."